I found this nice palm that is called Phoenix roebelenii in one of the local stores. I only had one plant at home, you can’t see that one fully as it is the plant in the orange pot, but I really liked the Phoenix roebelenii that I found in the store and searched in the internet if this plant could be toxic and dangerous for pets. 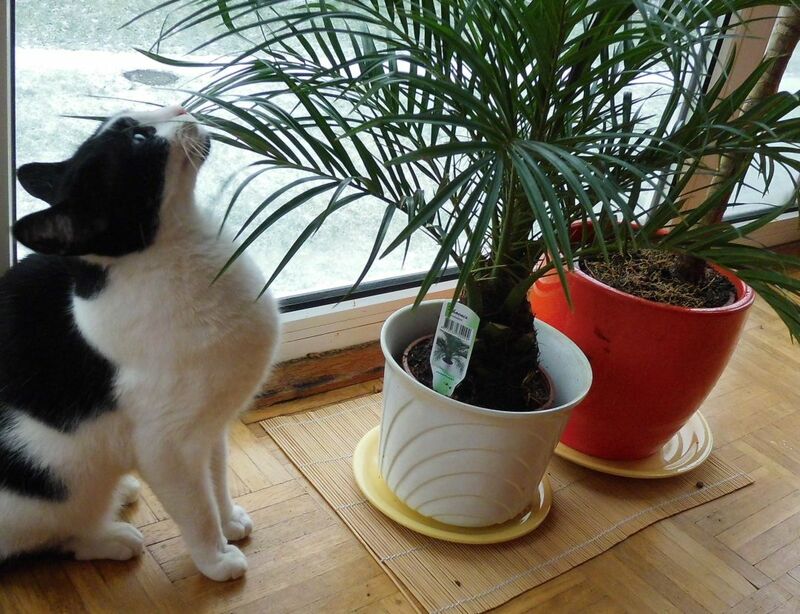 I found out that this plant is not listed as a dangerous plant for pets and went back to the store to buy the palm. I researched that this plant is also sometimes called pygmy date palm, miniature date palm or just robellini. As you can see on the photo above, my cat Shyna was curious about the Phoenix roebelenii right away and I am happy that I have done my research. Anyway, she never was curious about my old palm that you can’t see on the photo, she is more curious about this new Phoenix roebelenii and she tested some leaves already, but I take already care that this won’t become a habit. Not sure why she likes this new plant so much. But I noticed she doesn’t want to eat the leaves, she tried to gnaw the leaves and played with them with her paw. I think she was curious about the plant. On the photo above you can see my older plant a little bit better. Not sure how this plant is called. But on the left side you can see my new Phoenix roebelenii that I really like and that I have since some days now. Also you can see my cat again near the plants. By the way, I visited the same store again today and they have again some new plants but I was a little bit short in money as it is the end of the month. It’s tempting to get a third palm as they now have different ones and I might buy a third plant in a few days, but I am not sure yet. If so, I would like to have flowerpots in the same colour, now I just used what I found in the basement. I would like to have all flower pots in orange or in red I think. I also would like to find more of these bamboo mats, it’s a year ago when I found these mats in a store and I am not sure if they still have them. But for now I am just happy that I have two plants now. Let’s see if I buy a third plant. I would write about it if I do. Cats always seem to like what is new then get bored with it, much like humans do. My cat used to always knock over vases of flowers lol. It really was sort of humorous. I miss that lug. That’s an attractive plant Dennis. I’ve noticed the same, anything new that comes into the house Polly wants to see it. Cindy is a bit like that too. I think maybe it is the new smells that interest them. Shyna looks like she might be imagining herself to be in the jungle underneath the palm. I am still tempted to visit the store again as they had some more interesting palms but I would need to find a third plant pot. They have cool plants and they are cheap. 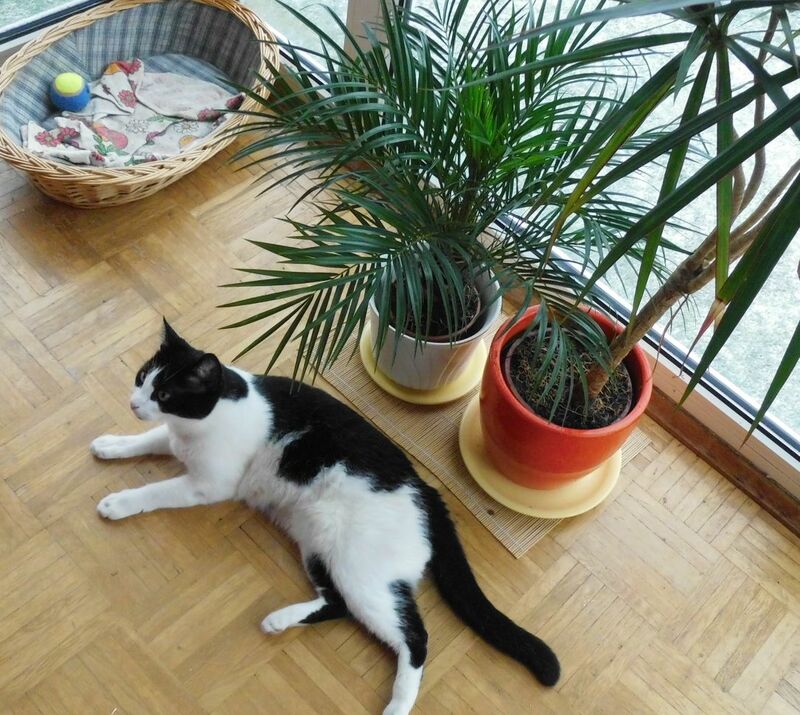 Yes, it seems as if cats make the quality inspection when we buy new things 🙂 Yes, the Phoenix roebelenii leaves smelled a little bit and I think too that cats are curious about any smell. I did shower the plant in case there would be residues of fertilizer on the leaves that could be toxic for Shyna, and after the shower I noticed the beautiful leave smell. Jungle underneath the palm, that is a good imagination. There is still some room for some more jungle plants for Shyna 🙂 It’s just sad that the plants are so cheap but the plant pots more expansive. I want to check out if I find a good looking but cheap set of flower pots in the locale stores or maybe in internet shops.